Honduras will elect new authorities for the executive and legislative powers of government this year. General elections will take place on the 26th of November, 2017. 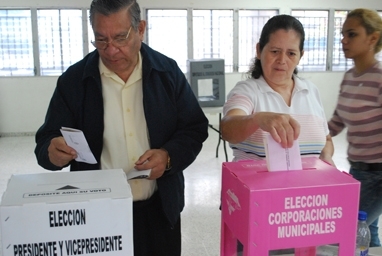 In total, Honduras will elect 128 congressmen for the legislative power. (Honduras only has one legislative power, The House of Representatives. We are a Central Republic and thus do not elect governors nor senators). We will also elect 298 mayors, one for each of the municipalities in the country. Each municipality elects a mayor, a vice mayor and members of the Municipal Corporation. They are the highest authority in each municipality. Last, but not least, Honduras will elect a president and three presidential designates. These are a Honduran version of vice-presidents. They step in to cover for the president whenever he is out of town or has a tight agenda and cannot take part in a particular event. Of course these presidential designates have a different status between them. The most important is the first presidential designate, the least important is the third. The Honduras political system changed in the last 4 years. The system used to be a bi-partisan arrangement. In the past it was controlled by the National (Conservative Party) and the Liberal (Center Party). Currently we have a four party system, and I do not expect any change for the following elections. The two new parties are Libre (Left Party) and PAC. This last one runs more on an anti-corruption ticket than any specific ideology. Three of those parties are having primary elections in Honduras this coming Sunday, March 12. In many ways, these primary elections are a waste of money. Everyone knows who the candidates will win in at least two of the three parties that are having elections. For the National Party, there are three options to vote. Yet I must note that at least for the presidential ticket, there are only two alternatives. President Juan Orlando Hernandez, currently in office is seeking re-election. He is the presidential option on two different tickets. The other candidate is running as a replacement for Ex-President Rafael Leonardo Callejas. Callejas could not run in the process because he is under house arrest in the USA for corruption as part of the FIFA-Gate scandal. The Candidate is Roberto Ramon Castillo Callejas. He is the underdog in this race and has no way to win the presidential candidacy of his party. I might add that presidential re-election is prohibited in Honduras. Yet, President Hernandez has managed to jump the constitutional blockage thanks to the help of ex President Callejas. To me it seems that Mr. Castillo Callejas is running for President as an effort to legitimize President Hernandez as the presidential candidate for the National Party of Honduras. Libre is the new party that ex President Zelaya leads. He was ousted in 2009. The party has several different internal movements that are looking for the candidacy. Everyone knows that ex-President Zelaya feels cheated and wants to return to power. He has chosen a different path and is promoting that his wife, Xiomara Castro de Zelaya be the official candidate. She ran against President Hernandez in 2013, and came in as a close second place in the race. Ex-President Zelaya is the current “Caudillo” or strongman in the party. It seems a waste of money to go through the process of primary elections when everyone knows that Xiomara Castro will be the candidate for Libre. The former first lady has evolved as a presidential candidate. Yet the truth is that her party has lost a lot of popularity over the last four years. Finally we have the liberal party that will also hold primary elections. The party seems to have reorganized itself and hopes to be reborn from the ashes after the political crisis in 2009 almost destroyed it. It has several different candidates that are interesting and capable. Anyone of two or three of them could come out as a winner from this primary election taking place on Sunday. In my view, the three interesting candidates are the following: Gabriela Nunez, Luis Zelaya and Enrique Ortez. Gabriela Nunez is an experienced politician who has a strong background in economics. She served as president of the Central Bank of Honduras during the Zelaya Regime. She was also finance minister during the Micheletti Regime. She is the best prepared candidate if you consider national finances. Luis Zelaya is without doubt the outsider as far as politics in the Liberal Party. He was until recently the dean at UNITEC, the leading Honduras private university. He is an attractive candidate for younger electors. The fact that he is a relative outsider, plus being attractive to younger adults may well make him the winner. Enrique Ortez is the third candidate worth mentioning. Over the last year he has taken the role as the opposition within the party against the current Hernandez administration. He has been quite outspoken, but, many consider him to be part of the old structure within the Liberal Party. They will be joining Salvador Nasralla from the PAC Party to seek election in the upcoming general elections. At this moment, it is way too early to determine who the final winner may be. It is clear that there are many different factors, both within and outside Honduras that can have an impact on the upcoming elections. We will follow them and discuss them with you in future posts. Luis Zelaya has won the Liberal party nomination for President. Xiomara Castro de Zelaya is of course the Libre Presidential Candidate winner. Once again our predictions have proven to be correct. Stay tuned throughout the year as we once again predict the winner of the General Election weeks before it happens. We have correctly predicted the Presidential winner since back in 1998. Editors Note: HondurasNews.com has assembled a diverse group of Honduran News Sources, Reporters, as well as Contributing Authors, and they are not employed or directed by the HondurasNews.com management team. The views expressed are their own. If you would like to contribute in any way to HondurasNews.com, please contact us and we will set you right up. Your feedback is important to us.